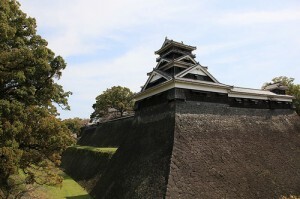 Kumamoto Castle was built in 1607 in [W:Kumamoto Prefecture]. The circumference of the castle is 5.3 km, and in the 98 hectare site, there are 49 turrets, 29 gates, 18 watcher gates besides the castles towers. The constructer of the castle is a bushi and also clan, Kiyomasa Kato ([W:Katō Kiyomasa]), whose idea of building castle is applied to today’s architectures. 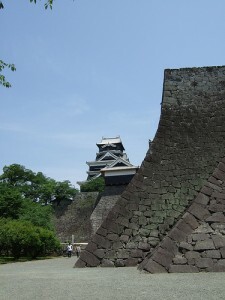 Kumamoto Castle was well designed to defend from enemies; for example, the tall stone fence underneath the castle shapes un-scalable J shape to prevent enemies to climb up. The fences are creating a maze to confuse enemies. Also, on the top of the stone fence, there are stone dropping trap to hit enemies. Unfortunately, large parts of the castle were destroyed during a civil war; therefore, the present castle was reconstructed in 1960. The castle is open for public and the large castle tower is a museum now. 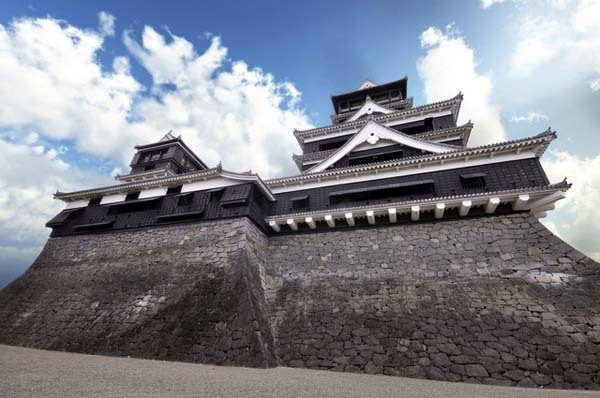 You can also see the castle in the famous Japanese director, Akira Kurosawa’s films.